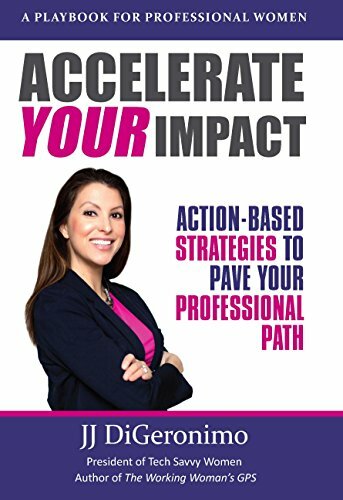 “Accelerate YOUR Impact: Action-Based Strategies to Pave Your Professional Path” was an interesting read and a book I wanted to like. This book reminds me of books like “Power Your Career: The Art of Tactful Self-Promotion At Work” and “Champion Your Career.” How JJ DiGeronimo sets her version of this same concept apart, though, is that it is intended as a “playbook for professional women.” Really, though, this book is intended for those who enjoy concepts that flow from one to another; if you are looking for a focused discussion on what it will take to pave your career path, this is not that book. I don’t want you to think there is nothing redeemable in this book because there is. DiGeronimo clearly knows and loves these concepts. Interestingly, she includes tips for identifying and joining both for-profit and non-profit boards of directors. I found this to be pretty unique information—she interviewed several women who are in these positions to provide advice on how they moved into these positions. I will continue to refer back to this information time and again, as I continue to build my career. However, the way it is written, this book may speak to some people more than others. This is a book that will take you in and out of concepts, quote other people’s work, and then drop you back into a concept from chapters before. This is not necessarily a bad thing; it’s just not for me. I prefer a more succinct style with chapter summaries and questions to make sure I’m on the right track. If you prefer this kind of style, you may also enjoy books like “Power Your Career” instead. That book follows the careers of four people at different life stages and how they applied the concepts of the book. I really wish that DiGeronimo had included something similar because I feel it would have strengthened the concepts presented in the book as well as added a thorough-line through the narrative. My biggest concern with this book, though, is the model the author uses. After reviewing this model several times, I just can’t figure out how to read it. At the top it says, “Accelerating Your Impact” and then has four arrows pointing in opposite directions. I can’t tell if the direction of the arrow means something. Below that is Accomplishments + Current Impact + Future Aspirations. Under that is Enriching Your Professional Brand. I think this needs to be explained more in the book. Overall, I appreciate the content, just not how it is written. As you read “Accelerate YOUR Impact: Action-Based Strategies to Pave Your Professional Path” by JJ DiGeronimo, keep the author’s words in mind: “life is a series of decisions, actions and connections that accelerate you each day to create the momentum to leap toward your specific areas of influence and impact.” Will reading this book be one of these decisions?